THEY are resilient, resourceful and innovative ... and extremely adorable to boot. With so much tenacity and charm, it's no wonder country youngsters are the perfect muses for the Bush Kids annual calendar. 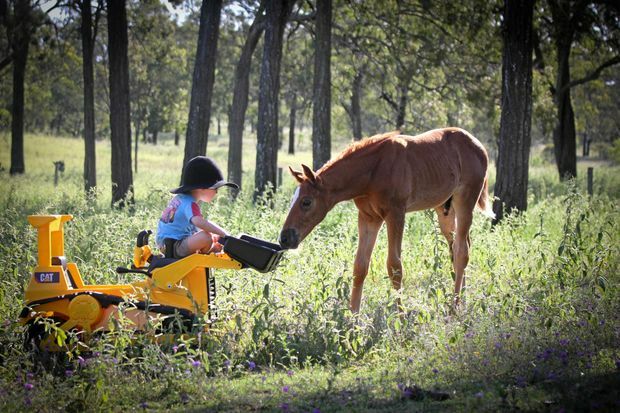 Bush Kids Facebook page founder Tricia Agar said the gorgeous photos sparked feelings of nostalgia for those who grew up on the land and highlighted the hard work being done by children in farming families. Although Bush Kids' 30,000 followers react more to "cute” images, Tricia said she tried hard to promote the pictures that showed older children working alongside their parents. "I say to people all the time, 'a bush kid doesn't get to choose to go home when they have had enough'. If you got on that horse in the morning, you don't get to get off it until everyone else is off in the evening. And if you are tired or bored in the meantime, well, that's just too bad for you,” she said. Tricia has a striking passion when she talks about the Facebook page. The mother of three, who lives on Barbara Plains, west of Charleville, said the site was geared at promoting agriculture and empowering those who lived on the land to feel proud about where they were raising their children. "People are realising this upbringing is so unique and so special. They are really starting to value it,” she said. "I think a few years ago they weren't valuing it. Tricia hopes her humble site is helping make a difference in promoting rural families. "It's pretty hard to gauge if you have made a difference or not,” she said. "But you know even if it's just one bush family who thinks 'you know what this life is a pretty good one. These kids might not be going to tennis lessons but by golly they can drive a vehicle, they ride a motorbike they can come mustering',” she said. Running a thriving social media page from a remote property has its challenges at times, but to her, it's so worthwhile. Last year the calendar raised $6000 for the Royal Flying Doctor Service Queensland division. "This year we are going to donate to the South Australia and Northern Territory division,” she said. Today the Bush Kids Facebook site has volunteers regularly helping run the site, including professional photographer Annette Schmike, who helps judge the page's photography competitions and Judi Bain who helps with the pages administration. The enduring dream of the Reverend John Flynn, lives on 90 years later in the form of Royal Flying Doctor Service, and I am personally pleased along with the Bush Kids Admin Team, to be able to put together this Bush Kids RFDS 2018 Calendar along with all of you who contributed photographs, to mark this special milestone.